Back in 1762, several Irish soldiers based in New York City decided to honor their patron saint with a parade. 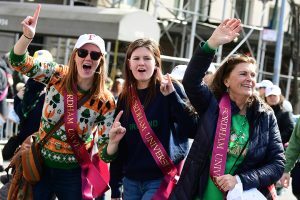 Some 256 years later, the St. Patrick’s Day Parade has grown to be one of the oldest and longest in the nation—some say the world. A Fordham contingent has been marching in the parade since 1937, with a brief hiatus during World War II. 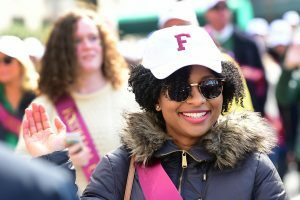 No fewer than eight Fordham alumni have served as grand marshals. 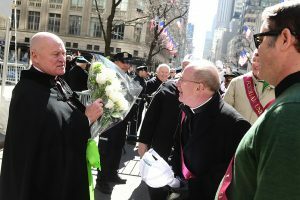 This year more than 500 Rams marched up Fifth Avenue past the cathedral bearing the name of the Irish saint, its soaring edifice built by Fordham’s founder, Archbishop John Hughes. 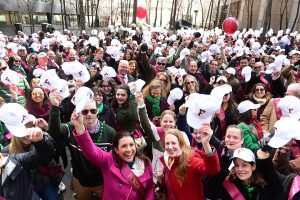 Before the parade, about 250 Fordham marchers gathered at the Yale Club for an annual breakfast. John Harrington, Ph.D., dean of academic affairs for Fordham’s new London Centre, gave a short talk about Irish studies at Fordham and its “lineage of strong scholars,” but he also homed in on Archbishop Hughes’s Irish past. The annual breakfast at the Yale Club. Harrington noted that that the Hughes family farm, like many Irish farms, wasn’t contiguous. Plots could sometimes be separated by miles. The Hughes family farm had plots set about a mile apart with the border separating Northern Ireland and the Republic of Ireland running between the two. Father McShane greets the rector of St. Patrick’s, Msgr. Robert T. Ritchie. Throughout the sunny day the mood remained cheerful, but suffering from The Troubles and the struggle of 30 million Irish-American immigrants was not far from the minds of marchers, not least Joseph M. McShane, S.J., president of Fordham. 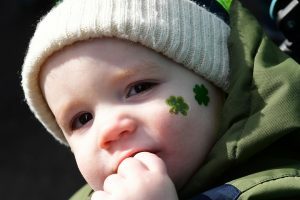 Father McShane said that St. Patrick’s Day is a day for “savoring everything our ancestors did to leave Ireland and come to a place filled with uncertain promise.” He said the Irish that left their troubled country would have never dreamed of the successes their children, grandchildren, and great-grandchildren would eventually realize. Patrica McCarthy, an M.S.W. 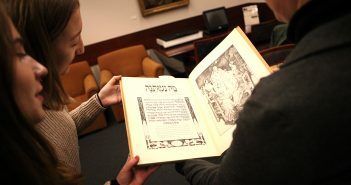 student at the Graduate School of Social Service, said that her grandfather came from Ireland. She said that it’s important to continue to “open people’s minds and to open doors” for immigrants. Her husband Kevin McCarthy, LAW ’78, agreed. McCarthy teaches at nearby John Jay College. “It’s important to try to legalize the status of our DACA students, especially for students at Fordham and at John Jay where there’s a very large contingent of DACA students,” he said. 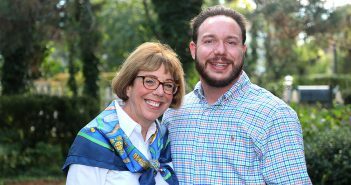 As they waited for the parade to start, Liam Strain, PCS ’03, and Mary Grogan Strain, FCRH ’92, said they represent a mixed marriage: He of Lincoln Center, she of Rose Hill. Liam said he should have graduated in 1984, but returned to get his degree in 2003. The Strains, like Harrington and others at the parade, also expressed concern about Brexit, saying that any “hard border” between Northern Ireland and the Republic of Ireland may disrupt newfound peace. When the Strains were in school they met at the Gaelic Society, where Liam was then president. Then, as now, the two said it was easy to draw parallels from the Irish experience to today’s immigrant experience. “Dagger John Hughes was a big defender of the immigrants—they happened to be Irish at the time, but that story resonates today,” said Liam Strain.